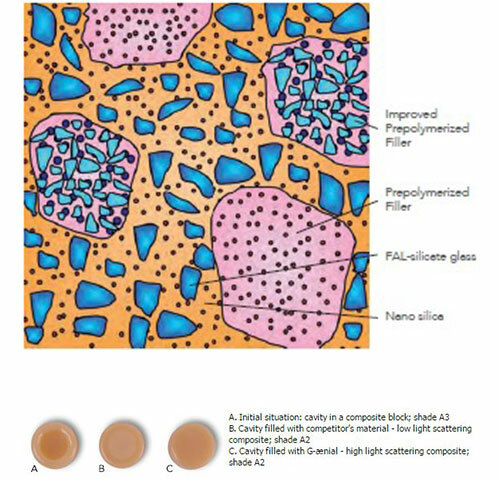 G-ænial is the material of choice when you are looking for a restorative that will meet the aesthetic expectations of all your patients - in most cases with only one shade. Being a forgiving composite that offers beautiful and natural looking high gloss restorations whilst being extremely easy to use, makes it a composite suited to everyday use. G-ænial also gives you more working time so you are free to shape and sculpt it to obtain the ideal anatomical form and aesthetics with ease. G-ænial blends and becomes aesthetically invisible because of its diverse composition, which mimics the reflective capabilities of a natural tooth.